Since I read Enclave a long time ago, I didn't remember the plot or the characters very well. 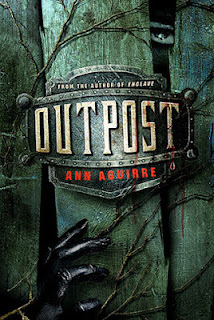 But I was feeling particularly lazy that day and didn't feel like skimming through the first book, so I cracked open Outpost and hoped for the best. If you don't remember Enclave very well and still want to read the sequel, I suggest that you recap on a few things. The first ten pages left me super confused because the author doesn't do much to jog your memory. She jumps right into it. After googling some basic information about each of the main characters, my memory of Enclave started to slowly come back to me and by the third or forth chapter I was cruising along and enjoying every minute of it! Outpost, starts off in the clean and sanitary city of Salvation. Salvation probably wasn't clean in our standards, but compared to what Deuce has been through the past months and the underground sewer sort of city she's lived in for the first fifteen years of her life, it's definitely considered clean! Although, some people welcome her and her companions with open arms, others look down at her for doing a man's job. This annoyed the crap out of me because the citizens of the city believed women to be subservient and only be of use in the kitchen or for pleasurable activities with the men felt like it. I think I got so annoyed at this part of the book that I literally snarled. Snarled! Of course, disgust was probably the emotion the author wanted to invoke out of the reader, and I would say that after what I felt, it was a success! I admired the way that Ann wrote about Deuce! From what I remember of Enclave, Deuce was an all steel and knives kind of girl. She spent her whole life training and fighting to earn her name as a Huntress. She even had to kill a full grown man when she was just twelve years old to be considered a adult and not a "brat" (the term they used for kid in her enclave) anymore. Throughout Outpost, Deuce still has that fierce and primitive edge to her, to the extent that my eyes widened at some of the things she did (For example, laughing when she was being mobbed by brain sucking Freaks). She kind of reminded me of the protagonist from C.J. Redwine's Defiance. But even though she's volatile, she's cunning and uses her brain in the face of danger, instead of just flashing out and instigating battles that cannot be won, like the main character in Defiance. Throughout the novel, we also see a more feminine and naive side to Deuce. Often in the book, she explains these two sides as Girl and Huntress, and that they are constantly at war against each other. Even though Deuce has clearly lost all innocence while living down below, she still holds a certain fascination and ignorance to simple things like birthdays that are almost childlike. All of these characteristics combined made a beautifully structured protagonist, and I loved reading about her! The secondary characters, Fade and Stalker weren't as outstanding as I found Deuce to be, but I still liked reading about them. I know alot of people cringe at love triangles, but I have to admit that I have a certain weakness for them! However, the love triangle in this book wasn't to die for. Fade, I kind of both liked and disliked. He was sort of stupid and blinded in the beginning. I can't really say much without giving spoilers away. Stalker, was described as being "the same" as Deuce. They were both fierce to the point of being a little on the scary side and both were always eager for action. Other important characters were Deuce's foster parents Momma Oaks and Edmund. In the beginning I wasn't to crazy about them, but that changed as the novel moved along. You can see that they really do care about her and think of her as their own daughter. The moments exchanged between them were touching and even made me cry! Overall, this book had an amazing storyline that I both loved and cherished. There was tons of action and hand to hand fighting for all of those who love fast paced books! The characters were well written, but I don't think I can pick between Team Fade or Team Stalker just yet. I'm not to crazy about either one of them, but hopefully that will change after the third novel is released!